Curved mouthpiece with slight upward curve and jointed center barrel. Function: Uses pinch and restrict with a release. Restricts the tongue and collapses on the bars slightly less than the EM 04. The center barrel rolls down and applies concentrated downward pressure onto the tongue. Each side of the mouthpiece moves independently, allowing one to lift one side off the tongue to the bar. 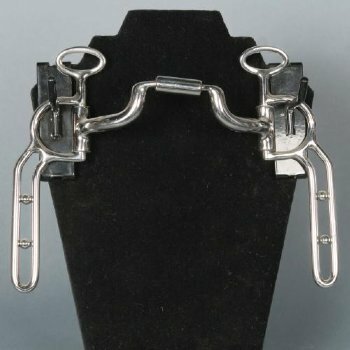 Releases tongue slightly more than EM 04 and can be used for a horse that has had some basic training and can be an alternative for use for the horse that is somewhere between an EM 04 and an EM 32HP or EM 36 in the training process. Level: Two, Three Usage/Solution: The EM 05 is an excellent in-between bit used well in horses that need a little less collapse on the bar but are not quite ready for the tongue freedom an EM 32HP or EM 36 provide. Good for use on young horses that have been driving for a short while or are light in the mouth and have some experience in single or multiple driving. Works well in single or team driving. Also available with bushing.